Note that 5 mW = +7 dBm for RF injection in a simple diode ring mixer. The VFO KIT has a +9 volts marking on the PCB. It should be +10V. The picture below shows C17/18 as yellow but they are blue. 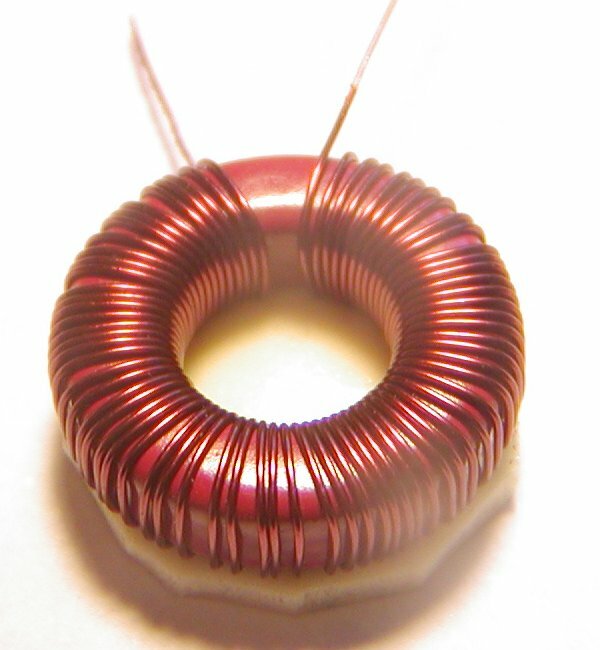 The "main" tune toroid (L1) is a T68-2 with 69 turns of #28 wire. drift from other circuit components. This toroid is a pain in the rear to wind; you will hate me for it. the spool of 28 ga magnet wire. Push half of the wire thru the toroid and start winding clockwise. it will become difficult to wind as you approach 69 turns. Make sure you do not cross/overlap the turns on the toroid. (but only if you did not curse while winding). Cut any excess lead length so that only one (1) inch remains. Locate the one (1) square inch of double stick tape. to the toroid, covering the toroid hole. With some wire cutters, trim the tape per the below picture. so there is a gap between the wire pigtails. by aligning it with the outline on the circult board. Pull the pigtails tight thru the PCB holes and solder. Save 6 clipped leads and install the clipped leads as jumpers between the VFO section and the VFO AMP section. Next we build T1, a 12 turn to 3 turn transformer. Cut 12 inches or 30 cm of the red 34 ga wire. Wind 12 turns thru BOTH HOLES of the BN43-2402 binocular. do not let the wire scrape the sides of the balun. We do not want to remove any insulation from the wires. Trim the wires to a one (1) inch lead length. Cut 6 inches or 15 cm of the red 34 ga wire. Wind 3 turns thru BOTH HOLES of the BN43-2402 binocular. Make sure that these wires exit the binocular on the other side. Trim these wires to a one half (1/2) inch lead length. the body of the binocular. Install T1 with the longer leads toward R7 on the right. DO NOT INSTALL CAPS C2,3,4,5. We will do this last. Install the yellow cap (C7) first. Install the 1000p	polystyrene as shown in the below picture. Make sure the outlines on the board match the parts. The "minor" tune toroid (L2) is a T37-2 with 35 turns of #28 wire. Make sure you have a tight wind on this toroid. Do not cross/overlap the turns on the toroid. Cut any excess lead length so that 1/2 inch remains. Install the toroid vertically per the picture below. If you have headers available, install them now. Adjust the 50K blue pot about half-way. To measure an output from the VFO, we need to turn on one of the PIN diodes by placing +12V on either PIN-1 or PIN-3 of the J3 header. Install a 43p and two (2) 33p caps at C3, C4 and C5 but do not solder. Form the leads to these caps so they make contact on the PCB. Connect 50 ohm load to the output and connect a scope to the load. observing current draw. Current should be about 39 milliamps. If caps C3,4,and 5 are touching the circuits, you should see a waveform on your scope. The trick is to find the correct capacitor combination to give you your desired frequency coverage and it all depends on component tolerances and the way you wound L1 and L2. 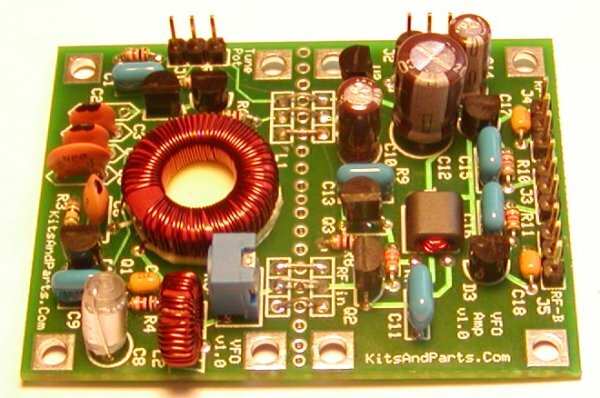 Find the correct cap combo and solder C2,3,4 and 5. Also included with this kit is 28 ga & 34 ga magnet wire. Not included are the header pins and the tune pot.